Notes: Love how this dress came out! The color is still not right – it’s emerald green, you’ll just have to trust me on that one. This is the first dress I have made, and the second pattern from Colette patterns. I would completely recommend this pattern, it turned out adorable. This is not necessarily a style that I wear easily, but as it turned out the slightly empire waist made it flattering! There were a few minor errors in my copy of the pattern. The pattern itself was fine, but there were several places in the instructions where pieces are misidentified in the text. The diagrams are all correct, and they were easy to spot. I did do a small bust adjustment, as the cups on the bodice were too large for me (I am a B cup.) I lapped the pattern 1/2″, and that made it fit perfectly. I also did an alteration to the back for upright posture. The idea (as I understand it) is that most patterns assume a slightly rounded back, whereas I stand all the time like I’m balancing a book on my head. This effectively removed 1/2″ in the back, making it even with the front. (Sorry for the wrinkles… I was sitting today!) I think my back is somewhat narrow as well, though my shoulders are not. The shoulders are quite wide on this pattern – I sewed snaps into them to attach my bra straps to, because otherwise they do show, and I think on the second try of this pattern I will narrow them a bit. 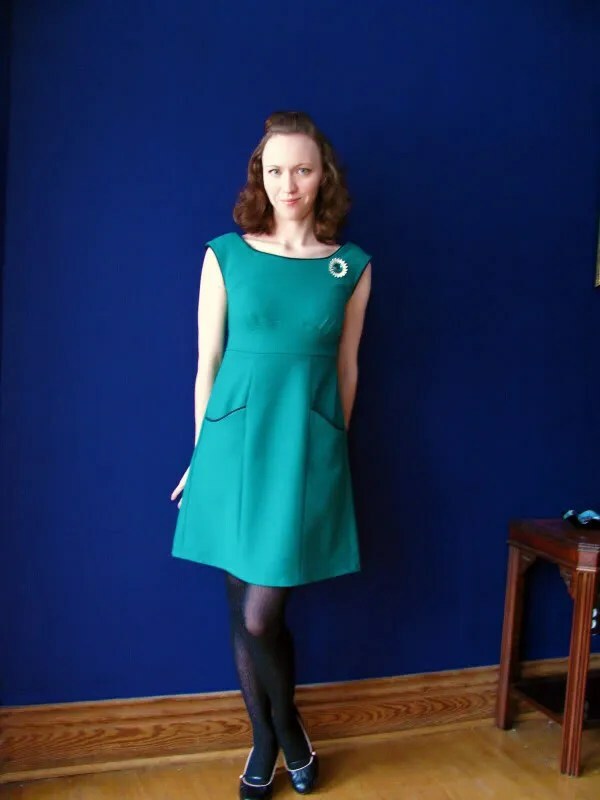 If I make this dress again (and I plan to, after all that work on the fit – I can imagine it several ways!) I will do a full lining. The pattern calls for facings that extend partway down the bodice. The facing shows through slightly – you can see the ghost of it in the first photo above. The wool crepe is thick, so I’d imagine under a thin fabric it would show even more. It’s also a little uncomfortable to me to have the facing end where it does. The rayon crepe that I used for the facing ravels like crazy – I had to be very careful with my seam finishes, and even so there are a few places that I’m worried about. The wool also ravels a bit. 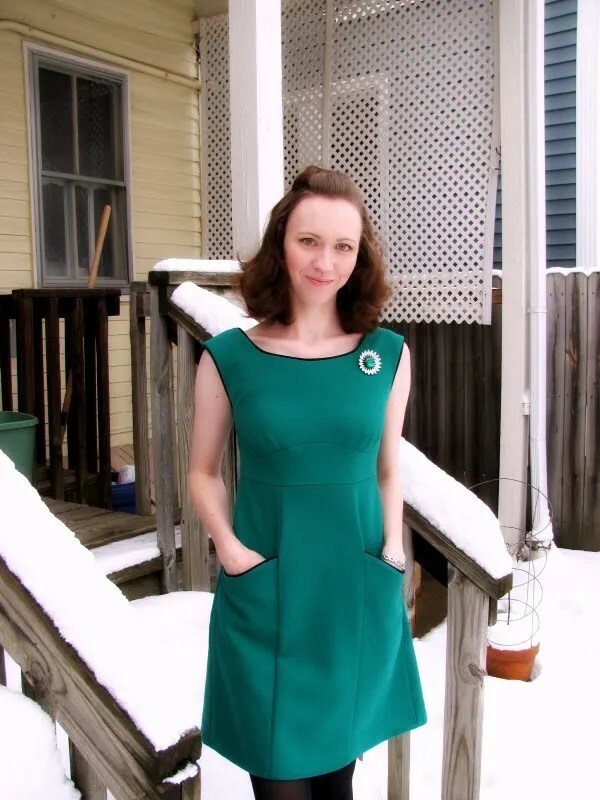 This dress made me decide I needed a serger, so I am purchasing one off of Craigslist – I got a good deal! I am still searching for a better way to preshrink wool fabric (without drycleaning… it’s bad enough I’m planning to dryclean this dress!) I was not thrilled with the results of the dryer method – while it did shrink, it also fulled slightly around the edges of the fabric, and there are a few pulled threads. No one but me would notice though! I think this dress has a bit of a 60s vibe, so I paired it with a vintage broach (my Grandma’s) which matches it exactly! My grandma had a ton of Sarah Coventry jewelry, and I’ve inherited the lot. I love pins and broaches, the bigger the better! This is closer to the color of the dress. I learned several new skills with this pattern. I learned to apply piping and an invisible zipper (both not hard, but I did get the special feet for my machine.) I am so thrilled with my dress, and can’t wait to make more! I am making this very dress! Lovely to see your version. It suits a wool fabric so well and you have done a gorgeous job. I love the brooch with it. It looks beautiful. Good for you–I hope you are proud. The dress is very lovely; it looks so professionally done! I love your hair in these photos as well; the loose curls are very becoming. You dress turned out beautifully! I love the broach with it. That looks absolutely gorgeous! I swear you could have stepped out of an old photo. You have such a gorgeous, old hollywood look. Love it and love the blog! Keep sewing! Of course you are thrilled! That came out amazing. Great hair and makeup styling to fit the dress, too. Love your blog. It is the first one I go to each day. Love to see all the progress. This dress is great and looks wonderful on you. You are my inspiration. Adorable! I love the piping. Cute! The color is fabulous on you too! that is so cute! what a great colour on you! Adorable is definitely the right word for that dress. It looks great! So cute! The fit looks perfect. I am so enjoying your sewing adventures these last months. Love all the ‘in progress’ details and your careful report when all is done. Wow! That is so cute! I’m really impressed with all the alterations you made to get it to fit. It looks perfect to me. I hope you do make another one because it looks great! Adorable! And great job – especially for a first dress! Love it! The dress is gorgeous and looks fantastic on you. This is soooo cute!!! Great job! The piping on the dress is such a sharp accent! It looks lovely on you, and I think your grandmother’s pin is the perfect touch. I love vintage pins and need to wear my own more often! I learned to preshrink wool (o many years ago) by placing the yardage between two damp sheets and allowing to dry. Another way is to have dry cleaners steam the whole piece and allow to dry flat (don’t let them fold it). I’m enjoying your sewing adventures and maybe I’ll get inspired to sew up some of my material stash! J – That is fabulous! Sewing agrees with you! And you look darn cute too! Looks so gorgeous on you! and that pin is pitch perfect. Really lovely…great snow picture too! The dress looks great on you! It is so satisfying to get the fit of a pattern just right. I have just started to really use my serger more – until now I was using my regular machine for everything except the hems, and using the coverstitch machine for those. Now that I’m getting interested in wovens, the serger is coming in handy for finishing all those ravely fabrics! I LOVE the brooch and this is my favorite hairstyle yet. The soft curls look great. That is SOOO cute. Totally professional, just like you purchased it from a department store! It looks gorgeous on you and you’ve done a great job – well done! – You might find that (if it is not too thick) a wool crepe facing won’t show as much, because it will behave in the same way as the outer bodice. – Because of your erect posture I would make the back bodice darts a bit longer, or even eliminate them altogether in conjunction with your previous neckline adjustment. – Because of your narrow back, scoop out a bit of the lower back armhole so it sits flatter – in the photo it looks like about half an inch could come off, but it might need less if you alter those darts. 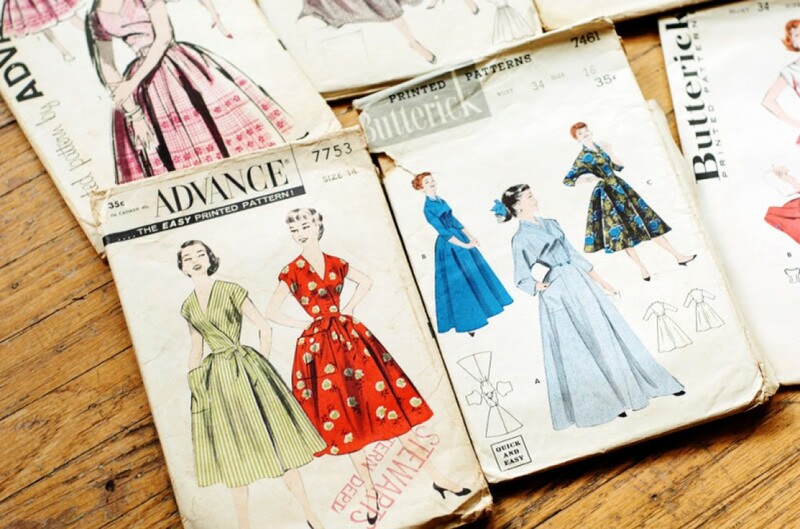 And congratulations on investing in an overlocker – you’ll never regret it! It’s been said about a hundred times already now, but that dress is *gorgeous*! Wow, what a beautiful dress! You did an excellent job! You look like a magazine model! Ok, I am inspired to sew again! You did beautiful work! Beautiful version of Rooibos! I am just passing out over the excellent fit. Can you tell me where you overlapped the 1/2″ on the pattern to make your SBA? If you are a B cup and had to make an SBA, I will most certainly need to as well. And thanks for the nice comment on my Macaron dress! Pingback: Rooibos – A Year On « Did You Make That? You are amazing! I love your blog and I love all the amazing dresses you make. You inspire me to keep sewing.